Washington's fish consumption rate is set at 6.5 grams per day (g/day). . . In 2011, Oregon raised its levels 30-fold to 175 g/day. . .
Several fishing and conservation groups have sued EPA to change its yardstick for estimating the daily amount of fish safe for Washington residents to eat. The estimate is used to help determine water-quality standards, and any increase would likely tighten those standards in the future. The groups claim the estimates used by the EPA are too low, and that the agency has admitted as much. "Washington's fish consumption rate is set at 6.5 grams per day (g/day). As such, it is not reflective of what people in Washington actually eat," said the complaint, filed Oct. 11 in U. S. District Court for Western Washington. The 6.5 g/day rate adds up to more than 5 pounds a year, according to the state. "EPA's inaction continues to allow polluters to discharge mercury, PCBs, lead and other toxins at levels that contaminate fish, pollute our waters, and threaten public health," said Janette Brimmer, an Earthjustice attorney representing the coalition, in a statement. "We have a water pollution problem that needs to be fixed now, and it is EPA's responsibility under the law to act when states fail to do so." The complaint argues that surveys of groups with large amounts of fish and seafood in their diets, like Native American, Pacific Islander and Asian communities, along with recreational fishermen, show consumption rates of 200, 300, and even over 500 g/day (100 grams equals about 3.5 ounces). In 2011, Oregon raised its levels 30-fold to 175 g/day, after the EPA concluded that the criteria values were based on a fish-consumption rate that was too low (17.5 g/day) to protect many fish consumers. The complaint cites a June 2013 letter from EPA to the state that said the best available science has found Washington's fish consumption standards too low, and urged the state's Department of Ecology to move forward. Since the state has not done that, the complaint calls on the court to order EPA to develop revised fish consumption standards for the state to comply with the Clean Water Act. 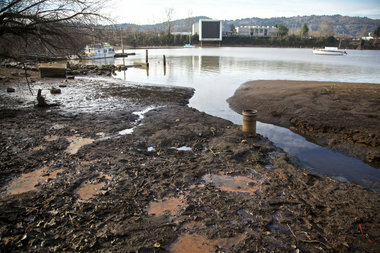 "The current under-protective standard allows too much toxic water pollution," said Glen Spain, Northwest regional director of the Pacific Coast Federation of Fishermen's Association (PCFFA). "This hurts the livelihoods of fish-dependent families, communities, and industries. A fish consumption standard that reflects reality not only makes good sense but would better protect fishing jobs and public health." Other groups besides the PCFFA involved in the litigation include the Spokane Riverkeeper, Columbia Riverkeeper, Puget Soundkeeper Alliance, and North Sound Baykeeper, along with the Institute for Fisheries Resources. The fish-consumption rate debate surfaced in a major way last June during the contentious battle over finalizing the state budget. For a time, Senate Republicans tried to use a proposal pushed by Boeing that called for the state to fund a million-dollar study by the University of Washington to develop fish-consumption rates, as a bargaining chip in the negotiations with Democrats. The study's findings were then to be used in rulemaking to revise clean water standards. Fish-consumption levels are used to develop water quality standards, and both industry and local governments are concerned that standards could be developed that would be impossible to meet. Boeing has said it would have to spend hundreds of millions of dollars to reduce its toxic discharges in state waterways if water quality standards are tightened. But the study proposal was later dropped, and the state is still working to develop new standards, now expected to be completed by the end of 2014. A January 2013 DOE report cited previous studies outside the state that estimated general consumers' median consumption around 19 g/day. But critics say that includes all types of fish and shellfish, and doesn't delineate where they came from. Some tribal studies have estimated median consumption by their members is nearly three times that level, including one conducted by the Columbia River Inter-Tribal Fish Commission. The CRITFC study of tribal members found the median level of consumption to be 58 g/day, and about 171 g/day for the top 1 percent of participants, similar to Oregon's new level of fish consumption rates of 175 g/day, which adds up to about 24 eight-ounce meals a month. The state of Idaho has used the 17.5 g/day rate since 2005, which is EPA's national default rate, but the federal agency has rejected the criteria used by the state to make that decision, because the state had not used several sources of information that suggested the fish consumption rate should be higher. However, the issue is complicated since EPA lacks the authority to mandate a particular fish consumption rate state in its standard-setting process. It's up to the states' own rulemaking process to figure out which rate to use.